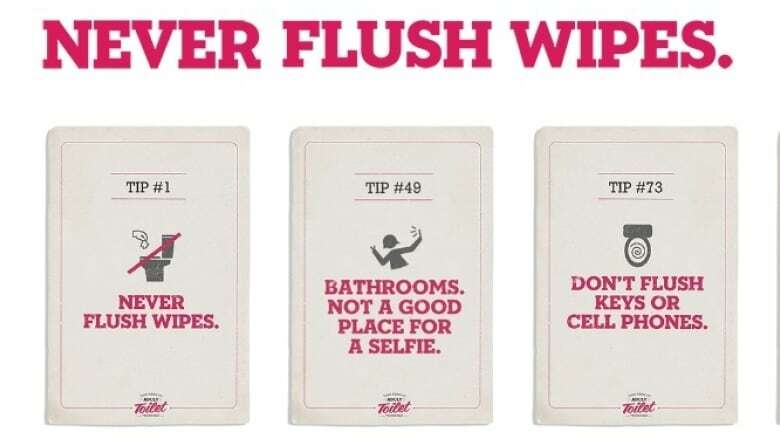 Metro Vancouver is launching a new campaign to remind people what can and cannot be flushed down the toilet. The regional district says it has already spent $100K this year removing non-disposable wipes from sewer pipes. Metro Vancouver is giving adults a lesson in potty training because it says Vancouverites are clogging up the sewer pipes with items that shouldn't be flushed down the toilet. The regional district says it has already spent $100,000 this year on unclogging non-disposable waste from its pipes. It says the main culprits are cleaning wipes. "We don't want people to flush down any products even if it says it's flushable, many of them are not. Those feminine hygiene products, we do not want people to be flushing them down. The only thing that goes down are number one, number two and toilet paper," said Darrell Mussatto, North Vancouver mayor and director of Metro Vancouver. Even though manufacturers of many adult wipes claim their products are flushable, they aren't, said Larina Lopez with Metro Vancouver. "There is no regulatory standard on what the term flushable means. There is a group across the country working on international standards around what it means to be able to put flushable around your packaging," she explained. .<a href="https://twitter.com/MetroVancouver">@MetroVancouver</a> wants to teach YOU how to use the loo. <a href="http://t.co/VXpHicfBw2">http://t.co/VXpHicfBw2</a> What do you think of this cheeky campaign? Metro Vancouver says toilet paper is the only acceptable foreign item that should be flushed down the toilet. It wants to educate adults on some of the more common items that still get dumped. This includes baby wipes, personal hygiene wipes, cleaning cloths, mop cloths and mop pads. These should be thrown in the garbage. This includes pads, tampons and applicators, dental floss and condoms. These items should be thrown in the garbage. Metro Vancouver says grease becomes hard in sewer pipes and causes them to block and overflow sewage. It suggests pouring grease into a tin can or milk carton, wait for it to harden then throw it in the garbage. Small amounts should be wiped with a paper towel and placed in food scraps bin. Food scraps should be placed in food scraps bin or backyard composter, not down the drain. These items should be taken to a take-back program. One of the top clogging agents in sewers is hair, says Metro Vancouver. Dispose of hair in the garbage. To hear the full interview listen to the audio labelled Adult toilet training with the CBC's Rick Cluff on The Early Edition.